The curving branches of a sturdy old oak tree reach up to the sky as a pair of birds settle down under its leaves. Sheltered by the tree, they coo to each other, ready to nest. The Oak is perfect for the shy lovebirds that want to build a world of their own, while still connected with tradition. This ketubah reminds us that, like the branches of the oak, our friends and family can be the greatest support for our love. THIS IS NOT YOUR TYPICAL KETUBAH: IT IS A FINGERPRINT KETUBAH! Merge two wonderful parts of your wedding: the Ketubah and the Signing Board! With this new designs you get both on the same paper, giving your Ketubah that extra touch that no other Ketubah will have: your guests finishing the art by imprinting the balloons with their own fingerprints! 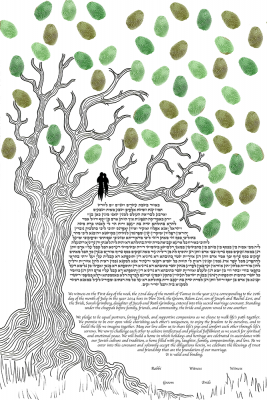 This ketubah can only be printed on paper (Verona or Hahnemüle); we strongly recommended the mounted Hahnemüle to make it easier to move around and avoid getting it wrinkled. You will need to buy a color pad; we’ll make some recommendations so it’s quick and easy.